News of St. John Island Tours: New Offerings including Half-Day Tours! Well folks, you spoke and we listened! We are now offering half-day island tours in addition to our full day tours, and our combination land and sea tours. Come and spend the day with us! Not familiar with News of St. John’s island tours? Well here are all the details! We started conducting island tours nearly two years ago, and the reception has been amazing! I absolutely love this island, and I love sharing that love with all of you. Whether this is your first visit to the island or if you are a repeat guest, I guarantee you will see something new. In fact, the majority of my guests are repeat visitors to the island! In addition to seeing the beautiful sights this island has to offer, you will also get the inside scoop on what’s happening here on St. John. During your tour, we will do a little sightseeing – St. John has some of the most beautiful views in the world. We will check out some of the island’s stunning beaches – who doesn’t want to dip their toes in our beautiful Caribbean waters! We can stop at one or more of the island’s sugar plantation ruins, and we can even do some light hiking if you’d like. I can guarantee some sea turtles sightings and we usually stumble on the donkeys too! I will tell you about the history of the island, and I can share with you the current happenings on island. Most importantly, we will have fun! So you may be wondering what makes my tour different from the other island tours? 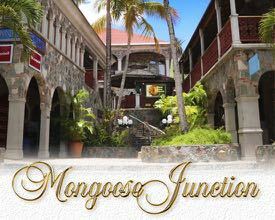 Well, what makes us different is that we are the only, personalized tour on St. John. I will take guests pretty much anywhere they want to go. The taxi tours are sometimes limited in where they are able to go, but not us. I enjoy taking my guests off the beaten path and to out-of-the-way spots that they would typically never see. Another difference is that I can only take up to four guests and I never combine groups, so it’s a more private and personal tour. When I am out and about with my guests, it’s more like I am out with friends. And I love that. Half-Day Tours: New for 2019! We are now offering three-hour tours. These tours are great for those of you who would like to see the island from the eyes of an insider, but you do not want to commit to an entire day to touring the island. During this tour, we can still do some sightseeing, we can check out the beaches, ruins, and do some light hiking while learning about the island’s history and current happenings. The only difference with this tour is that the stops are a bit shortened when compared to our full day tours. We offer half-day tours from 9 a.m. to noon or from 1 p.m. to 4 p.m. The cost for a half-day tour is $300. Full-Day Tours: Our full day tour is five hours long and includes a lunch stop in Coral Bay. During these tours, we can see nearly the entire island if you’d like to. We can check out the beaches, ruins, hiking trails and more! If you’d like to spend some time snorkeling with the turtles, we can do that! Want to see the more obscure, out of the way places? We can do that too! Again, all tours are completely customizable, so we will do exactly what you want? Don’t have an itinerary? Well we’ll provide options and you can choose what you would like to do and see! The cost for a full-day tour is $425. Land and Sea Tours: We offer St. John’s only land and sea tour. For this tour, we partner with our friends at Flyaway Charters in Coral Bay. These tours are six hours long. For our land and sea tours, guests spend the first half of the tour exploring on land with me, and then they spend the second half of the day on the water with Flyaway Charters. These tours are really the best of both worlds for someone who wants to see all that St. John has to offer in just one day. For the sea portion, you can visit the petroglyphs at the bottom of Reef Bay. This includes a short swim and a roughly 30-minute hike on flat ground, but it beats walking down the 2.6 mile trail and walking back up, which is currently the only other way to see the petroglyphs. 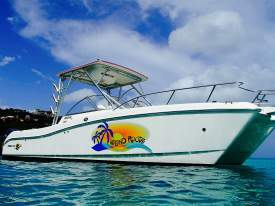 You can do some snorkeling at some great offshore spots and even visit Pizza Pi, the Caribbean’s floating pizza boat! Flyaway Charters can also provide a great deal of history of the island. The cost for a land and sea tour is $600. Fuel for the boat is not included, and costs between $100 and $150 depending on where you choose to travel. All prices are per tour. Don’t they all sound great! Whose ready to book??! If you are staying in the Cruz Bay area, I will happily pick you up right at your villa, condo or hotel. If they are staying outside of the Cruz Bay area, we can arrange a meeting point. We’ll pick you up with a cooler filled with water and ice, and if you’d like, we can bring along a jug of Painkillers for a small fee. We have beach chairs, a beach umbrella, sunshade, noodles and boogie boards for you to use throughout the day. And to make your day even better, we can even take the top off of the Jeep! You can book directly with me either by emailing me at jenn@newsofstjohn.com, by messaging me on Facebook at www.facebook.com/newsofstjohn, or by texting my cell at 203-376-3786. Please let me know which tour you prefer, as well as your preferred date. Want to know what other guests have said? Then please check out my reviews on TripAdvisor. I look forward to meeting you all and showing you just how amazing this little island is! Thanks everyone, and have a great day! Feel the breeze with our awesome convertible top! ← ACC’s Auction Happening Now!